As one of the UK’s leading training companies, we’re passionate about the power of training. We know your people are your biggest asset. So we use all our knowledge and experience to create award-winning training programmes that inspire your people and enable your business ambitions. 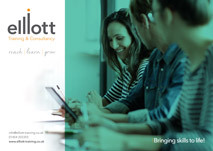 Our range of training courses have been carefully formulated to meet the varying learning and development needs of employers of all sizes and across all industries and sectors. Training can be delivered in-house or at one of our training venues with customisation which makes our training more effective and specific to your company’s needs.